A sepia tone photograph of the Lippert Furniture Company, Kitchener, Ontario. This building was located at 222-228 Louisa Street. It was originally erected in 1899 and a large addition was completed in 1903. 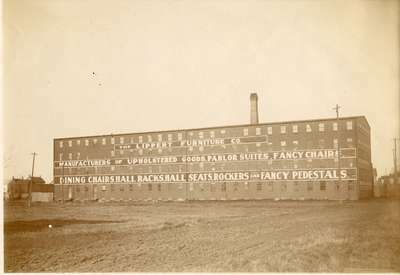 The text on building reads: The Lippert Furniture Co. Manufacturers of Upholstered Goods, Parlor Suites, Fancy Chairs, Dining Chairs, Hall Racks, Hall Seats, Rockers and Fancy Pedestals. George Lippert started the Lippert Furniture Company (originally known as Lippert & Company) in 1900. The building was located at 222-228 Louisa Street, Berlin (now Kitchener). A large addition was completed in 1903. The company made chairs, hat racks and parlour furniture. Another family business was run by George’s son, George J. Lippert. This business was called George J. Lippert Limited and started crafting grandfather clocks and furniture in 1910. George’s company was located at 31 Michael Street, Berlin. This business was also known as the George J. Lippert Table Company. George Lippert, Sr. died in 1927 in Kitchener. When the Depression hit, The Lippert Furniture Company went out of business only to be restarted by another of George’s sons, Herbert A. Lippert. The H. A. Lippert Furniture Company operated in the former Louisa Street plant with 10 employees and produced desks, bedroom and dining room suites, and unfinished furniture. Upon H.A. Lippert’s retirement, his sons, Herbert A. Jr. and Terrence Lippert, took over the business. By 1957, the name of the company changed to Artisan Cabinets. The company manufactured bookcases, unfinished chests, television cabinets and leather topped desks. The George J. Lippert Limited and Artisan Cabinets both closed in the late 1950s.